This is one of those schoolgirl paintings that I live to find! Wonderfully folky, delightfully composed, a real treasure. 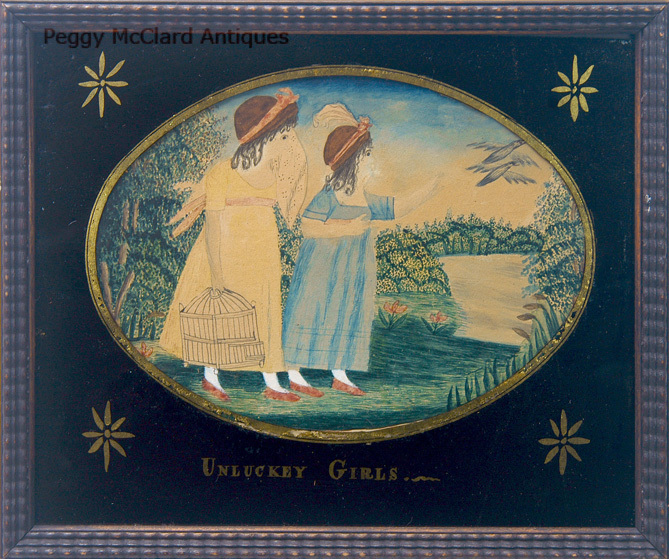 "Unluckey Girls" is the title reverse painted on the églomisé glass mat. The two young girls have apparently taken their pet birds for a walk, only to have them escape. They stand in a small clearing at the edge of a body of water with trees surrounding them. 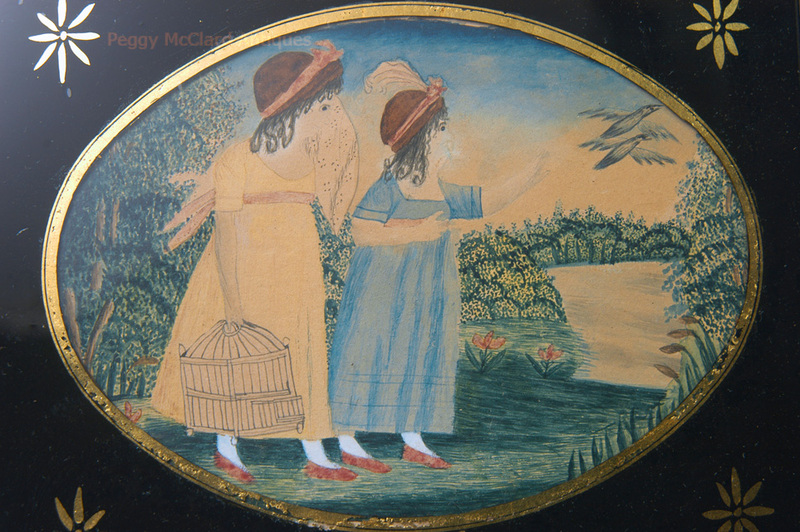 The girl in yellow holds the cage and weeps into a handkerchief as the girl in blue reaches towards the flying birds. 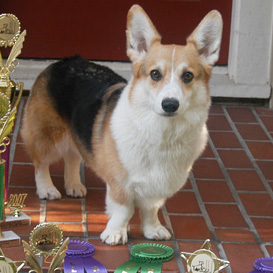 Both girls wear hats with a large pink ribbon hat bands. 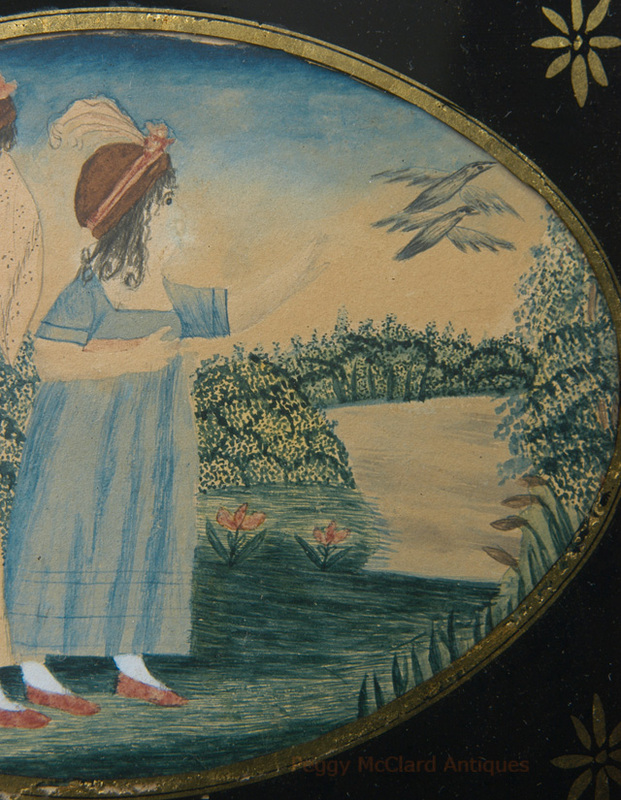 The girl in blue wears a feathered plume in her hat band. The girls' dresses have empire waists, tied with a ribbon sash. The dresses are ankle length and they both wear red slippers. I found a print source from which the schoolgirl painted her artwork. This lovely painting was likely painted at a school girl's academy. The églomisé glass mat definitely has some age, but I'm not sure it is original to the painting. 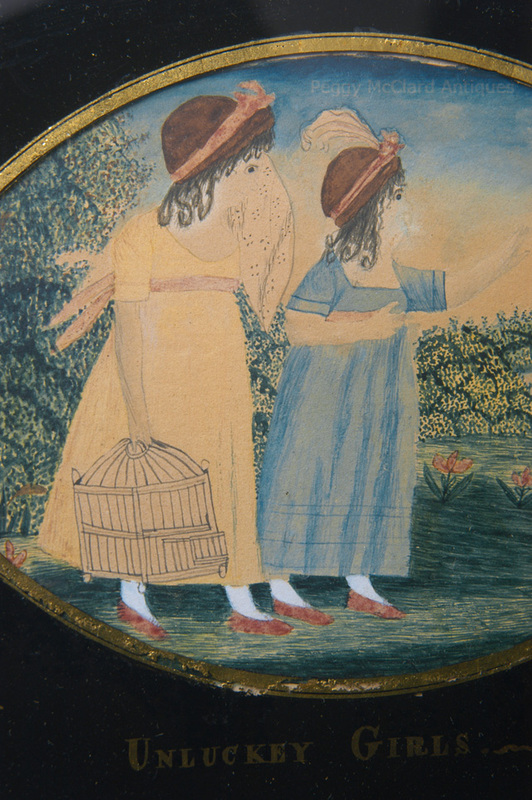 As you can see in the scan at the bottom of the page, the painting has an oval drawn around the perimeter and the bottom of the page is inscribed "Unlucky Girls". Now it would not be unheard of that the framer misspelled the word "unlucky" on the églomisé. Remember that in the early decades of the 19th century, people still spelled things phonetically and spelling varied between individuals. I think the misspelled word adds greatly to the charm of the painting. 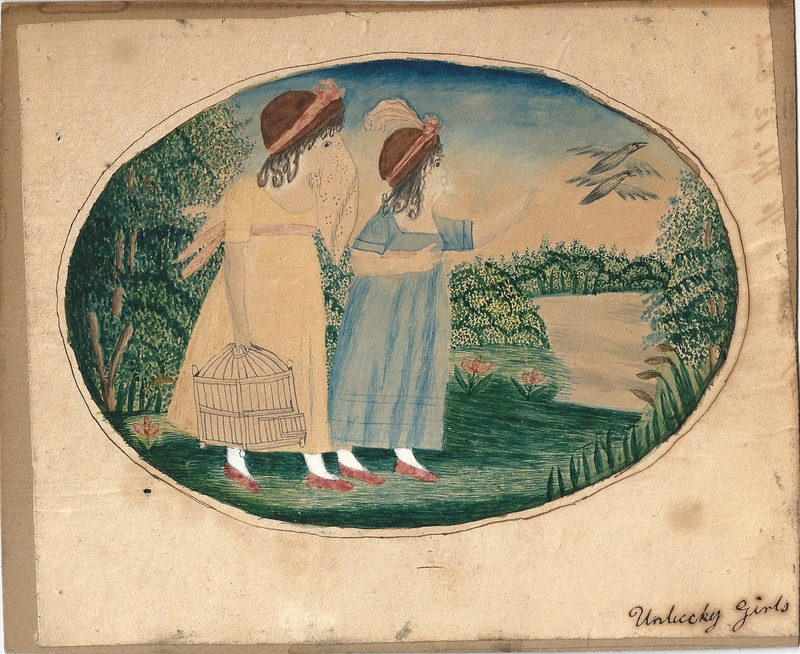 The paper on which the unlucky girls are painted is laid down on card. The piece resides in a black painted ripple wood frame which measures 8 3/4" x 10 1/4". There is an inscription written on the back of the paper that shows through the unframed paper on the right edge. It is illegible. This is a really lovely piece of American School folk art. Circa first half of the 19th century.